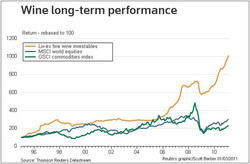 The liquid asset that outperforms - the wine cellar club ltd.
LONDON, March 1 2011 (Reuters) - Drinking it in moderation might be good for your health but before you uncork, consider -- fine wine is also a better investment than equities and commodities. 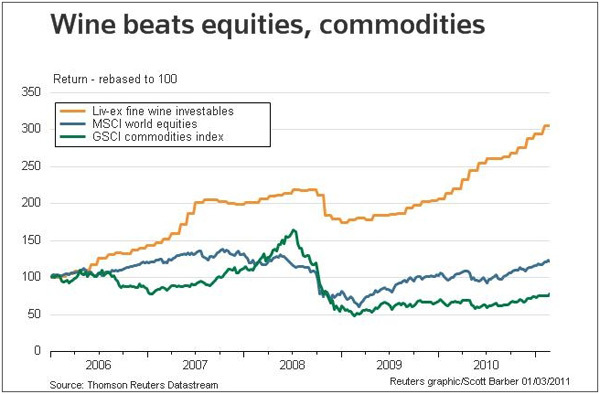 Using Thomson Reuters Datastream, it tracks the Live-ex Fine Wines Investible Index against the MSCI developed world stock index .MIWO00000PUS and the Goldman Sachs Commodities Index .SPGSCITR over the past five years. 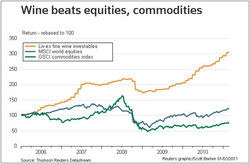 Wine has more than tripled from a 100 base in 2006 to over 300 while equities are around 125 and commodities have actually fallen on a total return basis. Wine not only managed to weather the recession and stock market crash, it thrived in comparison with the others. The popularity of wine as an investment has risen in recent years on the back of new money coming in from mainly Asian emerging markets. Auction houses sold more than $350 million worth of wine worldwide last year, an amount roughly in line with or exceeding their pre-recession levels of 2007. The Liv-ex Fine Wine Investables Index tracks wines commonly found in a wine investment portfolios based on a mid-price. The index consists only of Bordeaux red wines from 24 leading chateaux, which is perhaps a bit surprising as this second graphic -- rebased to 1995 -- looks bubbly enough for Champagne.